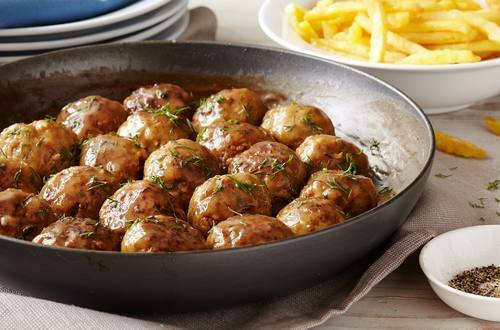 Children as well as adults will love this simple but tasty Swedish meatball recipe with ground pork, egg, fresh dill and Hellmann's® or Best Foods® Real Mayonnaise. 1 Combine ground pork, onion, bread crumbs, egg yolk, 1 Tbsp. dill and Hellmann's® or Best Foods® Real Mayonnaise in medium bowl; shape into 1-1/2-inch meatballs. 2 Cook meatballs in non-stick skillet until thoroughly cooked, turning occasionally, about 5 minutes. Remove meatballs and set aside. 3 Melt Country Crock® Spread over low heat in same skillet, then stir in flour. Add Knorr® Beef flavor Bouillon Cube(s) and water. Bring to a boil, stirring frequently, until Bouillon is dissolved. Reduce heat to low and simmer, stirring frequently, until sauce starts to thicken, about 10 minutes. Return meatballs to skillet and stir to coat with sauce; heat through. Garnish with remaining dill.